(WIS) - Ahead of Wednesday's severe weather, here is a list of closures, cancellations, and delays from across the Midlands. Click here to download the WIS Weather app ahead of the severe weather. Newberry County School District will release students early Wednesday morning. Elementary will be released at 11 a.m. middle and high schools will release at 11:30 a.m. In order to get students, faculty, and staff home safely and there will be NO LUNCHES served. All after-school activities have been canceled as well. Fairfield County School District has CANCELED school on Wednesday due to severe weather. Orangeburg Consolidated School Districts Three, Four and Five schools will dismiss early on Wednesday. All schools will open at the regular time but will dismiss beginning at 11 a.m.
For additional information about a specific school, parents may contact the principal’s office at their child's school. Early dismissal means that ATEC and elementary schools will close at 11 a.m., middle schools at 11:15 a.m. and high schools at 11:30 a.m. Three- and four-year-old students in half-day programs will not attend. School offices and the district office will close at 1:30 p.m. Both breakfast and lunch will be served. The lunch menu will be changed to accommodate the early release. Students will be served pizzas or calzones with fruit and milk. All April 5 after school and evening activities and programs including PEP, Boys and Girls Clubs, sports practices and events, adult education classes and the evening TABE test, meetings and other extracurricular activities are also canceled. Calhoun County Public Schools will be dismissing early on Wednesday. K-8 schools will dismiss at 11:30 a.m.
High school will dismiss at noon. Lexington-Richland School District Five will implement an early release of all students Wednesday. All after school, Adult Education classes and evening activities have been canceled. Delayed opening on April 5 for middle and high schools also are canceled. CrossRoads Intermediate and Chapin Intermediate will release at 11:30 a.m. Elementary schools will release at 11:45 a.m.
Academy for Success will release at 12:20 p.m.
Spring Hill High School will release at 12:25 p.m.
Middle schools and high schools will release at 12:45 p.m.
Richland School District Two will dismiss early on Wednesday. Middle schools will dismiss at 10:30 a.m. Elementary schools will dismiss at 11:15 a.m. High schools will dismiss at noon. Wednesday is still a late start day for all high schools. All after-school events and activities, including after-school care, are canceled at all schools. Lexington County School District One will dismiss all Lexington One schools early Wednesday. Child development classes for 3-year-olds and 4-year-old kindergarten classes will not meet. Lexington One elementary schools will dismiss at 11 a.m., while middle and high schools will dismiss at 12 p.m. The district will serve an early lunch. The district is also canceling all after-school programs, athletic practices or events, adult education classes, other school or district-related meetings, events or extra-curricular activities scheduled for after school or evening on Wednesday. Lexington 2 Schools will dismiss middle and high schools at 11 a.m. Wednesday; elementary schools will dismiss at noon. All after-school and evening activities and events for elementary, middle and high schools on April 5 are canceled including after-school child care programs for elementary schools and all sports practices and events. Lexington 4 School will dismiss early. Gray Collegiate Academy will not have school Wednesday. Felton Laboratory Charter School in Orangeburg is CLOSED on Wednesday. Red Bank UMC Preschool will be closed on Wednesday. Calhoun Academy in St. Matthews will dismiss at noon on Wednesday. All after-school athletic events and practices are canceled. Babcock Center will close at 12:45 p.m. for their vocational and day support services to Richland and Lexington counties. Kids Unlimited in Prosperity and Kids Unlimited Too in Newberry will be closed at 11 a.m. on Wednesday. 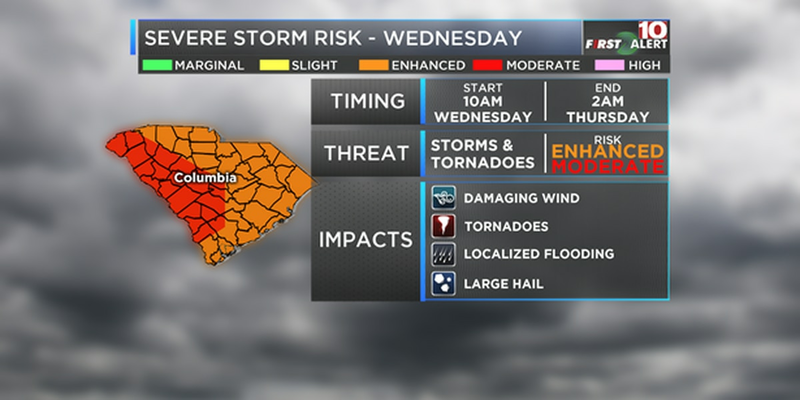 Parts of South Carolina are at a high risk for severe weather on Wednesday according to the Storm Prediction Center. The western Midlands counties are under a moderate to enhanced risk for severe storms, while the rest of the Midlands are considered a moderate risk by the SPC. TIMING: There will be 3 waves of concern, Wave 1 10 a.m. – 3 p.m.; Wave 2 4 p.m. – 9 p.m.; Wave 3 11 p.m. – 4 a.m. Thursday morning. The strongest wave will arrive in the early afternoon, so prepare accordingly. THREAT: Gusty winds that can lead to impacts on tree limbs and power lines, lightning which could start fires, large hail which could damage crops and property and localized flooding in the low-lying area, there is even a very good chance of tornadoes (EF-2 and higher). Tornadoes may be covered by rain and hard to detect. Mobile home owners need to monitor conditions all day.